There are a couple of interesting things to note about this query. First, SQL Server Management Studio on my laptop says that it takes nine seconds to run, even on a warm cache; the Duration column for the Query End event in Profiler, however, shows a value of around six seconds. The three second difference must be the time it takes for SSAS to return the cellset to SQL Server Management Studio, and for SQL Server Management Studio to render the results (my guess is that it’s the second operation that takes the majority of this time – other client tools may be more efficient at rendering large resultsets). The third thing to notice is that there is only one Storage Engine operation – shown by the Query Subcube Verbose event in the first Profiler screenshot above – and that hits the Storage Engine cache and is so quick the Duration column shows 0 ms. Getting the raw data isn’t the problem here, and there aren’t any MDX calculations either – which means that it’s the Non Empty filter and construction of the cellset that is taking all the time. Since neither of these operations can be cached (although you can play tricks like this), this explains why the query always takes six seconds to run, even on a warm cache. Further investigation reveals that the Non Empty filter in fact only takes about a quarter of a second, so it’s the construction of a large cellset that’s the real problem here. This is why I say you should always avoid queries that return large amounts of data! SSAS is not very good at returning large resultsets. Incidentally, don’t fall into the trap of thinking that the values shown in the Duration column for the Serialize Results End event only represents the amount of time taken to construct the cellset. It shows the amount of time since the Serialize Results Begin event, and in between the Begin and End events all kinds of other things necessary for the query to return (such as the evaluation of MDX calculations) could be going on. In a lot of cases the Serialize Results End event shows a duration that is almost the same as the duration for the whole query, but that only means that serialisation was able to start soon after the query began. In order to find the overhead of serialisation you need to work out how long all these other things take and subtract that from the duration shown for Serialize Results End, and that’s easier said than done. Profiler (or indeed XEvents) can tell you a lot of interesting things about what happens when SSAS Multidimensional serialises the resultset returned by an MDX query. To be honest, this isn’t something I’ve looked at in detail before but recently I decided to do some research in this area – it turns out that monitoring the Profiler events related to serialisation can be very useful when you’re trying to understand what a Profiler trace is telling you about query execution as a whole. 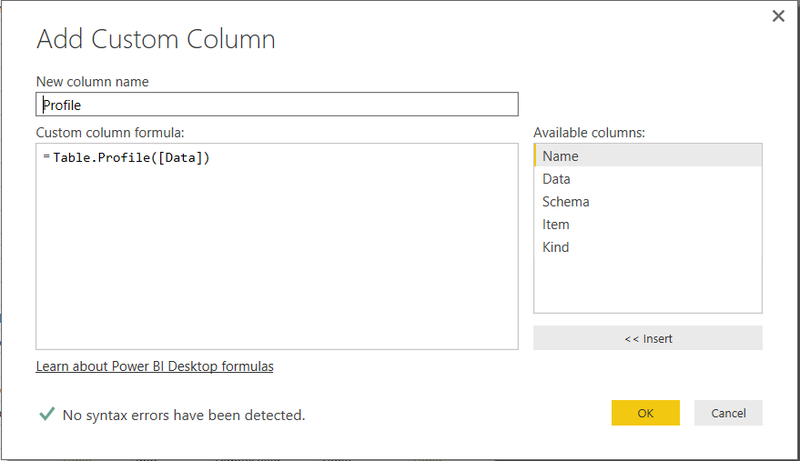 The Serialize Results Begin event marks the point where SSAS starts to construct the cellset returned. The Serialize Results Current events that immediately follow it, with EventSubclass “1 – Serialize Axes” show SSAS serialising the tuples that are present on the Columns axis (listed as Axis 0 in the TextData column), the Rows axis (Axis 1) and the Where clause (Slicer Axis). The numeric values in the ProgressTotal column for the Serialize Results Current events shows the number of tuples on each axis: the two tuples on columns are the two measures, the six tuples on rows are the six years, and there’s one tuple on the slicer. After that SSAS gets the data for each of the cell values (as shown by the Query Subcube Verbose event – note that this query is running on a warm cache) and there is then a Serialize Results Current event with EventSubclass “2 – Serialize Cells”; the ProgressTotal column shows that twelve cells (2 columns * 6 rows) in total were returned. The Serialize Results End event shows that SSAS has finished constructing the cellset and not surprisingly it’s followed immediately by the Query Cube End and Query End events. This trace deliberately doesn’t show any of events related to the NON EMPTY operation (something I’ll be writing about in future blog posts), but it looks like SSAS can work out which years have values and get the values needed for the cellset back in a single operation so there’s no need for another Query Subcube Verbose event before the Serialize Cells event. Note that now the empty rows have been excluded, the ProgressTotal shows that only four tuples are returned on rows and eight cells are returned overall. As you can there is now only one Serialize Results Current event and it has the EventSubclass “3 – Serialize SQL Rowset” (even though this is still an MDX query); the ProgressTotal column shows four, which is the number of rows returned. In Part 2, I’ll look at what happens when a query returns a much larger amount of data. 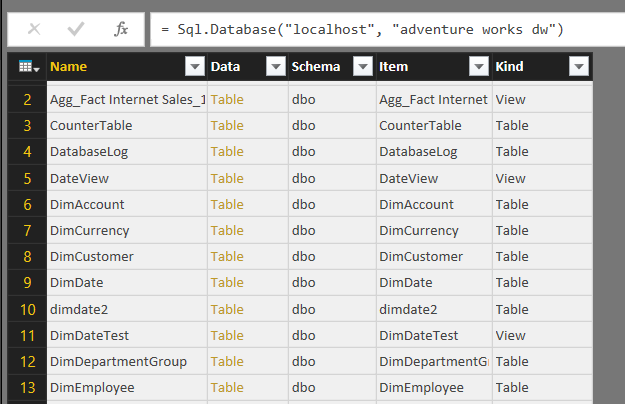 Yet another new M function for you this week: the Table.Schema() function, which returns information about the columns in a table. There’s some fairly detailed documentation about what it returns here; a simple demo is always a lot more helpful though, I think. If you want more detail when doing comparisons you can do that with a little bit more M code, but that’s probably a topic for another post..
Of course you could create something similar yourself fairly easily (as I have done for a customer in the past), and it’s not as sophisticated as the Quick Insights feature, but it’s handy to have a single function that does all this.